this is the 100th post of pimp and paint. WOW! i remember just a couple of years ago, a fren mentioned the word "blog". i asked him what it meant. he told me that it was anything you wanted to write about and post it on the internet for everyone to read. at that time i just couldn't figure that out. at that time i didn't even know how to use the internet properly! "you mean like a diary? for everyone to read?" i asked. he said, "well ... it could be, if you write about your life, but it could be anything else ... like happenings, art, stories ... whatever"
i nodded, yet ... i couldn't imagine why anyone would want to read about what other people are up to. let alone what i'm up to. i was wrong. around october last year, i was already out of a job for a couple of months. i began to feel really bored and like my brains we deteriorating at turbo speed! so i thought... maybe i should find something to do to pass time and maybe learn a few things on the way. a veteran actor once told me that when you have no jobs, unemployed, don't just do nothing. use the time to gather knowledge. and when the time comes for you to spread your wings again, you will be well prepared. he was darn right. so i wrote my first post on the 10th oct 2008.
just under a year in blogland and you cannot imagine how much i have learnt. i have, first and foremost, learnt about myself. i have rediscover a passion and learnt even more about it along the way. i have made some tremendous friendships in this virtual land. and tho i have never met these friends in life, i feel more connected to some of them than to frens i've known in person for a long time. and i find that i do want to read about the things they write. i do want to know how they and their families are doing. i laugh when they write about something silly and i cry when they are sad. how uncanny... but utterly magical! i would never regret writing my first post. right ... enough of me rattling cos we all want to know what the giveaway is right? in conjunction with the opening of my new shop "ithilien" i would like to giveaway this pendant i made specially for this giveaway. with all of my favorite things in there ... ivy leaves becoz it's so elven! 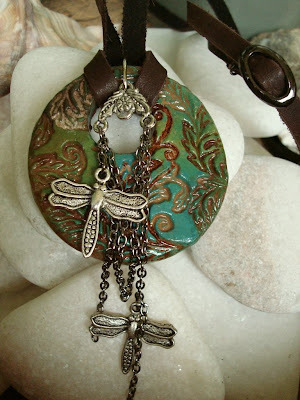 dragonflies are just magical and of course, my favourite colors, green, blue and turquoise. so if you do all three of the above, your name will get written on 3 pieces of paper and put into a bowl. to give everyone some time to play, the giveaway will be on till the 7th september 2009. the winner will be drawn the following day (well... as soon as i get everyone's name in the bowl in the correct amount of times :p) and a guest of honor will be called in to do the drawing. 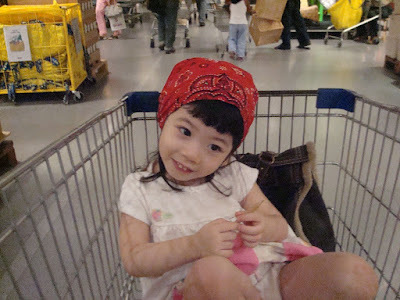 my little noty angel llara kaye will draw the winner of pimp & paint's 100th post giveaway :) and the announcement will be made soonest! just download the 100th giveaway button to your computer and then insert it as an image in a post OR go to dashboard, click layout and add a gadget. choose picture and browse the 100th post image and add a link to this post :) muax! Luthien! Your new jewelry is gorgeous. I can't believe I missed it. I THOUGHT I was following you, but now I made sure I am...Duh! Hey, I found your blog through Michele Lynch. I love it. I have a silk painting friend who can only see turquoise, purple and fuschia. Isn't it weird how color does something to each of us in a very personal way. Oooooooo Congrats on your 100th posting! Time flies, doesn't it? I just love this pendant Luthien...well done my dear! i'd love to be the winner of this pretty, pretty pendant, count me in. It has been such a pleasure to be bloggy friends with you ... you are such a kind and lovely person! Congrats again ... think I'll run and tweet about your 100th post! Congrats, Luthien. Can't believe it has been one year already. I am already a follower but I will add you to my blog. Again, congrats. I love that pendant. I am going to follow and grab a button. I would just be so happy if I won that, My sister would try to steal it from me would be the only problem with winning. I do not know if my last comment went thru so if it did just disregard this one. I love the pendant. sister will try to steal it from me if I won. I added your button and followed you. Very nice site. Your blog is just beautiful. I love your tutorials (can't wait to try the image transfer with sealant!). I am now a brand new follower:) I will definitely be coming back to see more of your work and tutes. Congrats! I'm so glad you decided to start this blog. wow!!! first day and so many already!! WOOPEE!!! thank you ladies for playing in my 100th post giveaway :)) i really really appreciate your participation :))thank you thank you thank you! I have subscribed to your blog since I first "met" you. I would be thrilled to win this lovely pendant. Ooh how exciting. I would love to enter - I'll put a link from my blog in a bit too! Now, onto your post. I know exactly how you feel. I too started my blog during a period of unemployment, I too recently passed 100 posts and I've also rediscovered all this creativity inside me. It has been an incredible journey and one which I feel is still just beginning. It has been great to virtually meet so many lovely people - something I just never expected. How wonderful to think that you are sitting the other side of the world, yet we have so much in common! Oooo.... I love to enter! Totally love all the crafts that you create and i want to own at least one item. Congratulations on your 100th post. I have very much enjoyed getting to know you and your artwork through your blog over this past year. You are so creative and funny. I am very glad that you took the leap and started a blog to share with all the world. How fun it has been. WOW, WOW, WOW!!! First of all CONGRATUMALATIONS!! on your 100th post - I honestly can't believe so much time has passed and I couldn't be happier for you!! This giveaway is as AWESOME as could be and your specially created prize is GORGEOUS!! So please count me in for that and I'll be posting your little giveaway badge on my blog seconds after I'm finished with this comment. But... one the the even bigger news - A SECOND SHOP!! Man oh man, you GO GIRL!! Luthien your jewelry work is absolutely exquisite (D agrees, lol) and I just couldn't be happier for you!! Your photos are fabulous too - really perfect! Lastly I just couldn't leave before saying how the magic of why I adore visiting your blog oozes out of every sentence of this posting - honest and heartfelt you brought us all along with you through your journey of discovering blogging and I adore you for that! Congratulations, Luthien on your 100th POST!!! I've yet to actually start my blog! You are SO talented! You pick up clay for the first time and are making jewelry like you've been doing it for years! I love ALL the pieces! Word's Worth is really beautiful as well as your give away piece. Your daughter is so cute! Just a doll! I am now following your blog and am happy to know about it! Here's to many more posts on your blog! I'm glad you're blogging; I really enjoy your blog. :) I'd love to win one of your pretty works of art- that is just lovely! I'm following your blog in blogger/google now; I was originally just following it using bloglines (there's where I keep all my RSS feeds). Wow, beautiful work! I just found your blog and added myself as a follower. I have made SO MANY blog friends in the year+ that I have been blogging. Love it! Congrats on ur 100th post. Btw, did i mentioned i love your blog? VERY MUCH? hehehe.... you are one of my inspiration luthien. Keep up the good work! Hey there I just wondered into your blog and a wonderful find it was. Great work. I too have come to the joy of blogging. I am now a follower too. happy blogging and congrats on 100th post very coolio. Oh Luthien! You never cease to amaze me, dear one. Not only do I love your artful, beautiful creations, but I love how sharing, caring and delightfully funny you are and it all shines through your wonderful Blog. Thank you for all that you are! I'm going to post about your give away - so gorgeous! Congrats on the new shop and I wish you much success always! Congratulations luthien,on your 100th post! great job! I love this pendant, its so beautiful. I'm a follower, this is my comment, and pls check my latest post where I blog about this great giveaway! I love this pendant! And congrats! OH WOW!!!!! 32 lovely people playing in my giveaway!! this is soooooo COOOOL!!! thank you thank you thank you!! Grats on 100 posts. Here's my post, I'm now a subscriber, and I grabbed a button for my site. Then necklace is awesome! Crossing my fingers!! Here's to 100 more posts. 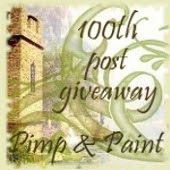 OMG!...Luthien, I posted your giveaway on my blog a few days ago..forgot to come back to comment! ...I'll be sure and become a follower, if i have not already!...geeze.. I have bookmarked your site here..I love it! What lovely pieces you create..Hope i win!.. thank you so much for a generous giveaway! Such a pity I lost it! It's one of the most beautiful and magical pieces I've ever seen. I'd love to win. Maybe you issue a new one when you reach 200 posts, right? I'll wish for that. Congrats on your your 100th post. May they multiply, as well as your numbers of friends. OH WOW!!! this is just fantastic! you are ALL fantastic for coming here to play with me :) thank you so very very much!! thank you thank you thank you!! MUAX MUAX MUAX!!! and BIG FAT JUICY HUGS TO ALL OF YOU BEAUTIFUL PEOPLE! !